I am sure you all have heard about ketogenic diet in the past. You may have watched Drew Manning go through his “Fit 2 Fat 2 Fit” transformation on the Dr. Oz show. While this diet might be new to many, it has been around for a while. The paleo diet is similar to a keto diet in many ways. However, our ancestors would eat root vegetables and fruit in season, which is limited in a keto diet. That being said, the type of fruits they ate were much lower in sugar content. The ketogenic diet became a method for treating disease in the 20’s. Back then the ketogenic diet was used for the treatment of Parkinson’s and epilepsy. This method of treatment was effective and was used for the better part of a decade until drug therapies were introduced. In the 90’s, Hollywood producer Jim Abrahams, whose son had severe epilepsy which was controlled by the diet, created the Charlie Foundation to promote this diet. Possible therapeutic uses for the ketogenic diet have been studied for the treatment of various disorders in addition to epilepsy; Alzheimer’s, ALS, Parkinson’s, autism (watch The Magic Pill on Netflix), brain cancer (cancer needs sugar to thrive), headaches, neurotrauma, PAIN, and sleep disorders. Many of my patient’s know I have Type 1 diabetes. I was diagnosed when I was 20, 30 years ago. Because I have lived the Chiropractic Wellness Lifestyle, I am proud to say that 30 years later I have had no complications due to my diabetes. I haven’t always been perfect, but I have always made an effort. 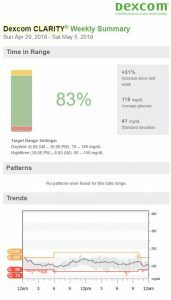 The week prior to starting the ketogenic diet I had an average blood sugar of 160 (not my best week). I used 290u of insulin for an average over 7 days of 41/ per day. 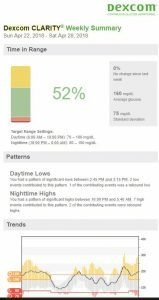 After my first full week of keto my average blood sugar dropped from 160 to 119. That is an A1c difference from 7+ to 6-, near normal. If I were a Type 2 diabetic I would probably be off my meds (disclaimer: never stop medication without first consulting your physician). The bottom line; My insulin requirement dropped from 290u to 145u, about a 50% reduction. I have been a little tired as my body is re-learning how to use fat for energy, but I felt so much better without the fluctuations in my blood sugar. This is HUGE! I have never seen a change this dramatic in such a short time with any other diet. My wife Beth and I are trying to stick to a calorie breakdown of 70% Fat, 25% Protein and 5% Carbs (I am not counting calories. I eat when I am hungry and stop when I feel full). Guess what, fat makes things taste good, cooking is easy and the fat makes you feel full longer. Here at In8 Wellness Center we are also a great resource! For our current patients a consult is just a call away, and any consult is always free of charge for you. Any new patients can give Eli a call and he can help you set up a New Patient Exam in our office (mention you read this blog and that consult is only $49). I am new to this but am excited about the changes so far. Stay tuned for updates! PS: Depending on your particular situation you may want to consult your physician prior to changing your diet. Do your research, ask questions.